When a newspaper endorses a political party or a candidate during an election, the public assessment of the endorsement tends to turn on two factors: the reasoning leading to the endorsement, and the perceived legitimacy of the newspaper itself. But, as in any kind of legitimacy judgement of an organization, the perception of a newspaper’s legitimacy isn’t based on a single event or piece of information. It’s based on multiple factors, including the perceiver’s beliefs about whether the organization’s actions “are desirable, proper, [or] appropriate within some socially constructed system of norms, values, beliefs, and definitions”. And that is where the Postmedia newspapers in Canada went so spectacularly wrong with their endorsement of the incumbent Conservative Party in the upcoming federal election. It wasn’t a surprise that Postmedia endorsed the Conservatives, given the Conservatives’ support of Canada’s oil and gas industry, and Postmedia’s willingness to offer its newspapers for “joint ventures” with that industry. And while the editorial board of a newspaper traditionally chooses which candidates or parties to endorse, it also wasn’t a surprise, given Postmedia’s top-down management style, that Postmedia told all of its newspapers to endorse the Conservatives. What was a surprise was that, the day after the endorsement, the front page of every Postmedia newspaper was a full-page advertisement for the Conservatives. As a former employee of a newspaper now owned by Postmedia, I was truly embarrassed to see that day’s paper, and I felt bad for my friends who still work at the newspaper. 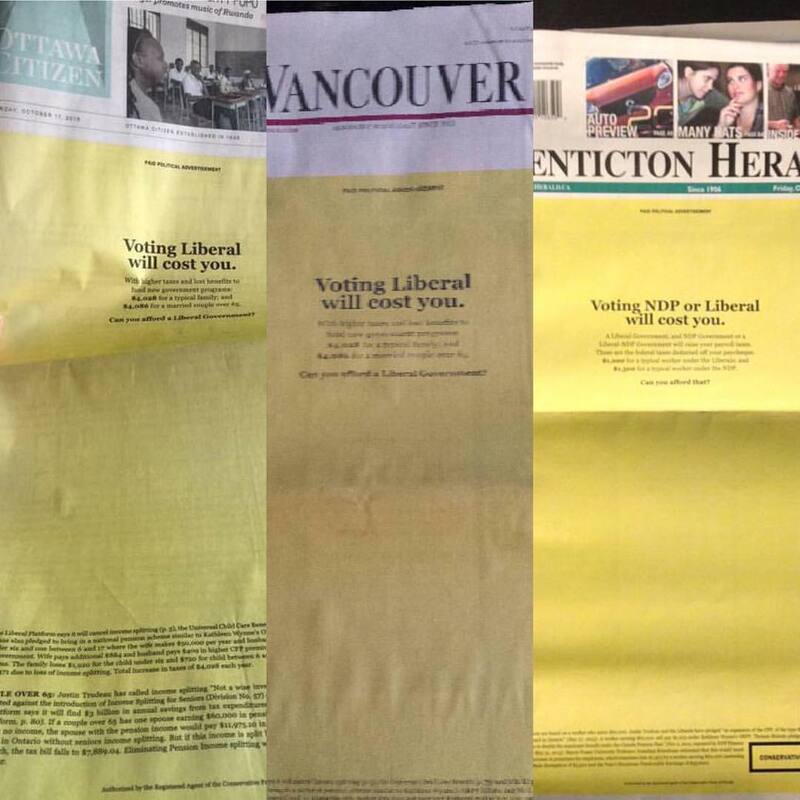 The placement of the ad was bad enough, but the design and layout of the ad looked like the design and layout that Elections Canada has been using in its election materials. It would be very easy for someone not familiar with Canadian elections to mistake this ad for an official government communication or directive. And it doesn’t say much about Postmedia’s corporate ethics or standards that Postmedia let the ad appear in that deceptive format. A couple of people I know were so angered by the ad that they cancelled their subscriptions to their local Postmedia paper. Interestingly, one of them phoned the Postmedia call centre to be sure Postmedia knew why they were cancelling – but before they could say why they were cancelling, the call-centre toiler asked if it was “because of the ad”. That suggests that my friends weren’t the only people letting Postmedia know that they found the ads offensive and inappropriate. And now I also feel bad for the workers at the Postmedia call centre who had to take the flack for their employer’s terrible decisions. Postmedia isn’t exactly in a financial position where it can afford to lose subscribers or business at its newspapers. But here’s the thing: when people make legitimacy judgements of organizations, “Not only must Justice be done; it must also be seen to be done”. The social norms and values around the news media include the expectation that editorial decisions are independent of business decisions, and that editorial decisions also appear to be independent of business decisions. It may well be that the Conservatives’ purchase of the ad in Postmedia’s newspapers had nothing to do with Postmedia’s decision to editorially endorse the Conservatives in the election. But, again, legitimacy assessments are made in a context of multiple events, and over the past few years Postmedia has had more than one event like this – where advertisers’ interests have allegedly affected its newspapers’ news content. That Postmedia apparently doesn’t care about being seen as biased – and that it feels it still has enough legitimacy or credibility for its endorsements to be taken seriously – is a very telling comment on its obliviousness to its environment. As population ecology theory explains, organizations that don’t understand their environment, or don’t react appropriately to changes in their environment, are at risk of becoming extinct. Postmedia likely gained a significant amount of ad revenue from collectively selling out its newspapers’ front pages for a single day. But it likely lost many readers, and likely also lost even more of its perceived legitimacy. Postmedia’s corporate decisions during this election may have negative impacts on its newspapers that will continue long after the election itself is over.